This theme is the official Eminence for Object Dock theme. 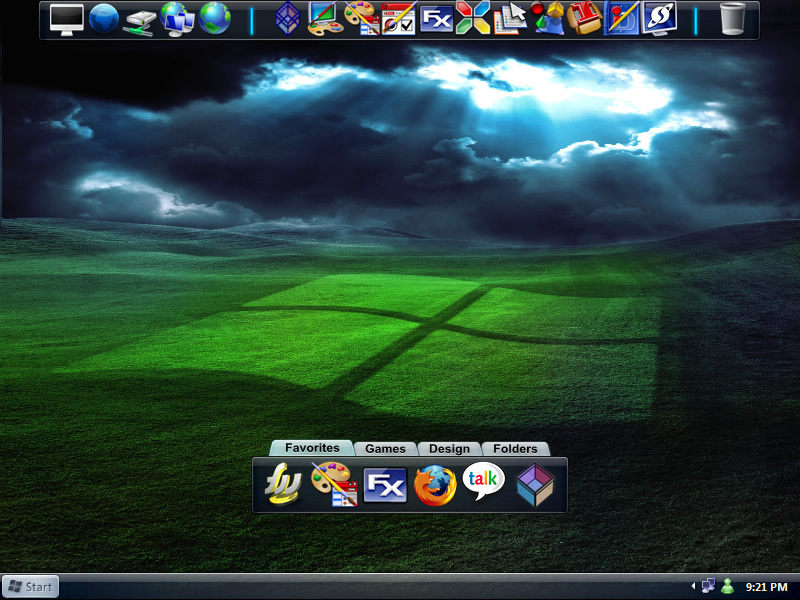 I am releasing it to go with the Eminence skin for Windowblinds. To install unzip the folder into the Backgrounds folder of the Object Dock installation folder. Very nice; goes well with the wb theme (as you'd expect). Hey I'm new to this. Can anyone walk me through how to load? I've tried to unzip to the background, but nothing happens. Thanks. After you unzip it to the backgrounds folder you must apply the background just as you would have to apply any other theme that you have installed with just about any other program. To apply the theme you change the background of your dock. Well, I can't apply this theme either. .Zer0, you stated that we need to apply the background just like any other program... I think this is what we're doing: unzipping the files into the correct directory; right-clicking our Dock and going to "Dock Settings" (General Tab); clicking "Load Theme"; and NOT seeing the Eminence theme. Any idea why? Hey guys what you do is-- go into Dock Settings, then click on Apperance on the left & then change the Background to Eminence & you can change it to Transparent or Opaque. Now if you have a Dock at the bottom w/ Tabs what you do is go to Dock Settings in that Docks menu (right click on the bottom Dock & select Dock Settings) this will open a different menu. This time click on Tabs & Styles and change all the Styles for each of your tabs to Eminence. Now Zero the ? I have is what Icon package are you using, for your Recycle Bin etc....? What kind of wallpaper is this, I like it ! Do you have list of variation like this if you come across any?. That's a nice wallpaper, indeed. Where can one download it? Do you have a link? I don't know about you guys, but I'm still confused. I have Object Plus 1.3. I clicked on Appearance and changed the Background to "Eminence" and all it did was change the color of my Dock to dark grey. Is there something more I need to do? My prob finally solved.But I thought the tabs too will be changes according to the themes. Boovu6: I have 1.3 as well. All you have to do is unpack the archive into a folder, it will by default extract to a folder called Eminence. Then take that folder and navigate to Program Files/StarDock/ObjectDock/Backgrounds/ and put the folder in there. Then right click you dock and go to dock settings choose the Appearance Tab and select from the Background dropdown Eminence. Then choose a color for the background and adjust the transperancy or don't colorize the background. About the same process for tabbed docks. Right click->Tab Settings->change Tab Style to Eminence and choose a color if you wish, then apply to all tabs. By the way, very nice Skin, I dig it. .Zer0., are the dividers on your dock by any chance inspired by Nintendo's Wii console design? I love it, but I downloaded and installed it, and all that changed was the wallpaper. What's wrong? Meaning that my Taskbar, menus, Start menu, and folder views are all still in Win 98 styling. I downloaded and unzipped the file into the correct folder (yeah! ), but have the same problem as comment #11 - only the background of the dock itself changed. No pretty picture. How are people resolving this? Hey, how do i get THOSE EXACT icons, i mean thats what will complete this dock. Is it available off wincustomize? Wow... It's very easy, To set up and what not thanks to everyones help. But now my only question is.. How can i remove the Recycle Bin from the Desktop???? Please help. Thanks zero, this is a very nice skin. Can you tell us which icon set you are using there, that would really complete it? Click start -> goto Run -> type "gpedit.msc" and hit enter -> then goto "Local Computer Policy --> User Configuration --> Administrative Templates --> Desktop" -> on the right side of the window right-click "remove recycle bin icon from desktop" and select properties -> in the new window choose "Enabled" -> hit Ok and your done. Sometimes you need to restart the comp for the changes to take effect.